We invite you to come join ILDA! Membership in the International Laser Display Association is open to companies, organizations and individuals who manufacture or use laser display devices or services. There are five categories of Membership: Corporate, Nonprofit, Individual, Hobbyist and Student. These are described below. Members must affirm their commitment to safe laser shows, and to ILDA's Code of Ethics and Code of Business Practice. A complete list of requirements is here. For more information about the many activities and benefits of ILDA membership, click here. To apply for ILDA Membership, click the button above to go to the Join ILDA page at our Member & Event Management website. If you have any questions or problems, feel free to email or call us directly. ILDA Members who attended the Awards Banquet held during the 2015 Conference in Dubai. Previous conferences have been held in locations such as Germany, Russia, China, Netherlands, Italy, the U.S. — and even on board cruise ships. ILDA also has a program where companies can gain special accreditation based on professional experience. The “ILDA Pro” designation can be earned by Corporate Members as well as by non-members. 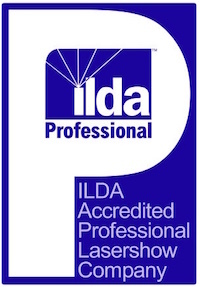 For more information, see the ILDA Professional page. Corporate Members are companies involved with laser displays and shows. This includes making and presenting laser shows, manufacturing lasers and equipment used in laser shows, and providing lasershow-related services including software and artware. Which Corporate level is right for you? There are three levels of Corporate Membership. The higher your company’s gross annual billings (gross sales) for lasershow-related goods and services, the higher your Corporate Level and dues. This way, larger companies pay more, yet ILDA is still affordable for smaller companies. Details are here. Corporate Members have 4, 3 or 2 votes for the Board and President, and on issues affecting ILDA. The higher the level (e.g., the more dues paid), the more votes a company has. If you have branch offices in other countries, you may want to consider having a separate Membership for each major location. For a discussion of the advantages, see the Branch office listings policy page. Joining April 1 - Oct 31. Dues are prorated. The later in the year you join, the less you pay for your first year. The online application form automatically applies the correct discount. Nonprofit Members include museums, schools, planetariums, trade associations, national and local government offices, and other not-for-profit organizations. Nonprofit Members have one vote for the Board and President, and on issues affecting ILDA. An Individual Member is a person who is interested in lasers and who is not an employee of an ILDA Corporate or Nonprofit Member. This includes freelance laserists. This is a non-commercial membership with restrictions; it is not for companies. Individuals are listed in ILDA directories by last name, first name such as "Smith, John" or "von Hoffman, Gabriela." Company names are NOT allowed for Individual Memberships. Individual Members have one vote for the Board and President, and on issues affecting ILDA. Individual Members can run for the Board of Directors and (if elected) President. Individual Members can participate in and can be voting members of ILDA Committees. Individual Members, like all Members, can enter the annual ILDA Awards competition. A Hobbyist Member is a person who is interested in lasers and who is not an employee of an ILDA Corporate or Nonprofit Member. This includes freelance laserists. This is a non-commercial membership with restrictions; it is not for companies. Hobbyists are listed in ILDA directories by last name, first name such as "Smith, John" or "von Hoffman, Gabriela." Company names are NOT allowed for Hobbyist Memberships. Hobbyist Members cannot vote for the Board of Directors or President, and do not have a vote on issues affecting ILDA. Hobbyist Members cannot run for the Board of Directors. Hobbyist Members can participate in ILDA committee discussions but cannot be voting members. Hobbyist Members, like all Members, can enter the annual ILDA Awards competition. A Student Member must be enrolled full-time in an accredited school, college or university. ILDA may ask to see proof of enrollment. This is a non-commercial membership with restrictions so that it is not for companies. Students are listed in ILDA directories by last name, first name such as "Smith, John" or "von Hoffman, Gabriela." Company names are NOT allowed for Student Memberships. Student Members cannot vote for the Board of Directors or President, and do not have a vote on issues affecting ILDA. They cannot run for the Board of Directors. Student Members can participate in ILDA committee discussions but cannot be voting members. Student Members, like all Members, can enter the annual ILDA Awards competition. If you are doing laser shows commercially and wish to use your ILDA membership and the ILDA Member logo to promote your business, you should be a Corporate Member. Even if you are just one person and not a corporation or LLC, you still can join as a Corporate Member if you are doing commercial shows and want to use your ILDA membership and ILDA Member logo to promote your business. If you are a person who is not employed by an ILDA Corporate or Nonprofit Member, you are eligible for an Individual, Hobbyist or Student membership. You can decide whether you prefer to join as an Individual or as a Hobbyist (or if you are a full-time registered student, you may choose to join as a Student). Your choice may depend on how you wish to be listed, the benefits such as votes that you wish to receive, and the dues that you wish to pay. Individual Members have one vote, can run for the Board of Directors, and can be voting members of a committee. Annual dues are $130. Hobbyist and Student Members do not have a vote, cannot run for the Board of Directors, and cannot be voting members of a committee (they can participate in the committee discussions). Annual dues are $95 for Hobbyists and $50 for Students. Individual, Hobbyist and Student Members cannot use their ILDA membership to promote commercial laser display activities. If you are doing laser displays commercially, join as a Corporate or Nonprofit Member. For more information, see the page Restrictions on Individual, Hobbyist & Student Members. Photo credits: Top, “Schaumburg” by spectrabeam.de. Body, 2015 Awards Banquet attendees by 3rd Dimension EvenTech.